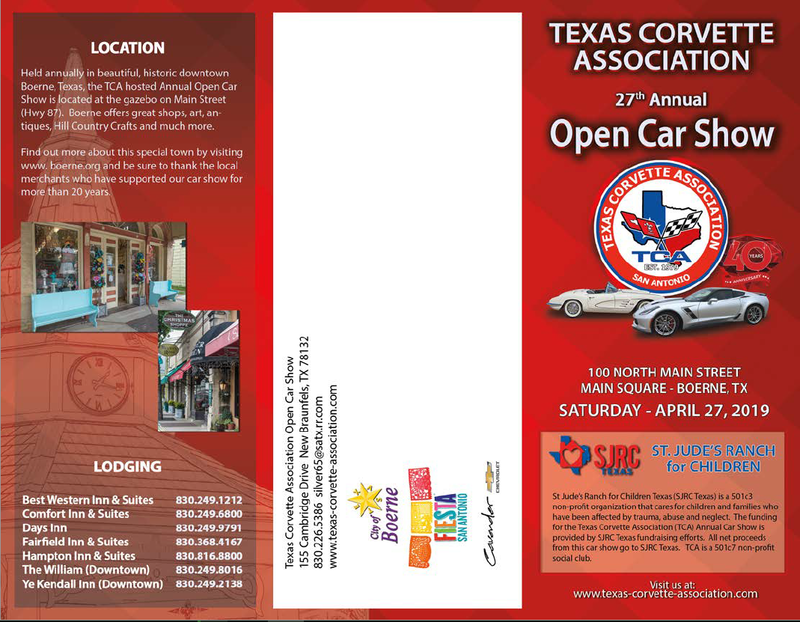 The annual Texas Corvette Association (TCA) Open Car Show has attracted car enthusiasts from across the state, the country, and from places as far away as Australia since its inception in 1992. Since 2000, the TCA has dedicated itself to supporting SJRC Texas as its charity of choice and the recipient of funds raised from the annual car show. SJRC Texas serves the San Antonio, New Braunfels, and Bulverde communities by offering a safe haven to children who have suffered trauma, abuse and neglect. Participants in the TCA Open Car Show make an important contribution in support of those initiatives, while enjoying a popular Fiesta® San Antonio event. In recent years, the car show has attracted over 300 entries and hundreds of visitors annually to its Texas Hill Country location at the Main Plaza in Boerne, Texas. 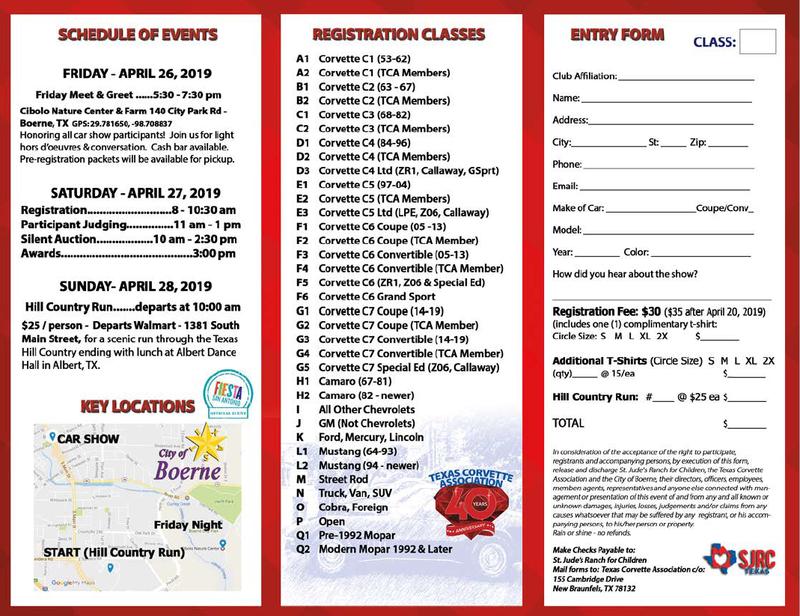 The 2019 show will be held on April 27th, and all proceeds from the show and the silent auction will benefit SJRC Texas. When you get to the final screen for payment you will ONLY SEE A PROMPT FOR PAYPAL. This is our payment processor. Click on the Paypal logo, but when you see this prompt, click to pay with a Debit or Credit Card. Do Not Log into Paypal unless you plan to pay using your paypal account. 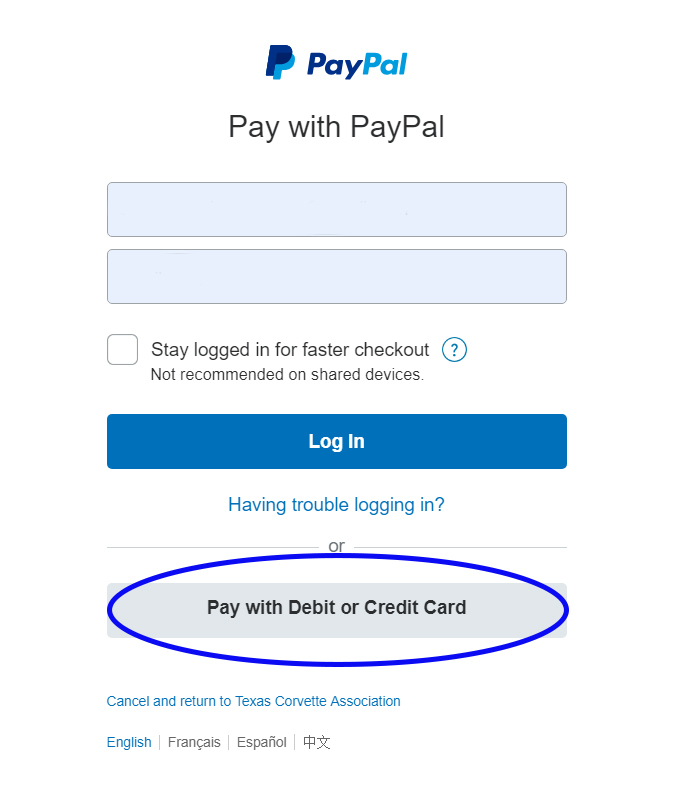 In addition to paying by a credit card via the PayPal interface or using your PayPal account, you have the option of printing an invoice at checkout and mailing it in with your check. If paying by check, payment must be received within 15 days or your registration will be cancelled. There will be no refunds as this is a rain or shine event. One T-Shirt is free with Registration. Additional shirts may be purchased for $15 each. All proceeds from the silent auction benefit the children at St. Jude's Ranch for Children. Be sure to check out the auction tent and place your bid. Auction ends at 2:30. Stop by to claim your items. We have separate classes for TCA and Non-Members. Awards will be presented at 3:00pm at the gazebo on the main square.